Digital revenue at GNM was said to be up 24 per cent to £69.5m for the year to March 30 2014. 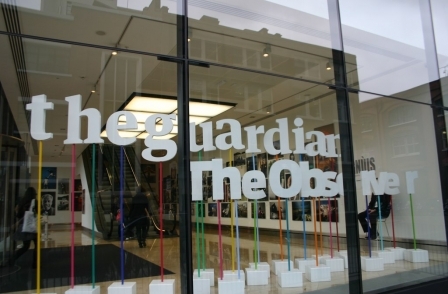 On underlying basis (without one-off costs), Guardian News and Media was said to have made a loss of £19.4m, compared with £26.6m in 2012/2013 (last year's figure has been re-stated by GMG to exclude Kable, which was sold late in 2012). Investment in the launch of Guardian Australia a year ago and in a new “membership” project both had an impact on the bottom line. The overall balance sheet of Guardian Media Group has been swelled by nearly £600m compared with last year, mainly as a result of the sale of a 50.1 per cent stake in Trader Media Group. This means GMG now has £842.7m in the bank compared with £253.7m this time last year. If GMG reaches its target of making 5 per cent interest a year on that money, it means the group can afford to lose up to £40m a year. GMG reported an overall operating loss for 2013/2014 broadly in line with this target, at £40.8m (down from £46m a year ago). Guardian Media Group chief executive Andrew Miller received some £1.4m from the Trader Media Group sale as a former financial director of that company. This brought his total remuneration for the year to £2.16m. Guardian editor Alan Rusbridger’s total remuneration was flat year on year at £491,000. Miller said: “We successfully completed the divestment of Trader Media in a transaction that will sustain our finances for generations to come. This significant deal has coincided with an encouraging increase in underlying revenues, particularly from digital activities.